As one of the newest and most innovative injectables on the market today, Kybella offers both men and women a permanent solution to removing unwanted fat from under your neck, as well as double chin treatments. Kybella® is the first injectable treatment of its kind that has been approved by the FDA (Food and Drug Administration) for fat reduction of the neck also known as a non-surgical necklift. At J Spa Medical Spa, Dr. Jacono has been using Kybella® to help rejuvenate his patients neck and chin area by creating a smoother and more sculpted chin. He accomplishes this by removing the excess submental fat which is the main problem. There are several reasons that this excess fat is present in the neck, such as weight gain, genetics, and in many cases the normal signs of aging. While diet and exercise can help with fat reduction in the other areas of the body, it cannot help with removing that stubborn fat from underneath the chin. Kybella® is created from a molecule, that is naturally found in our bodies, called Deoxycholic acid and helps to break down the fatty tissue in your neck. Kybella® is injected into the patient’s fatty area of the neck and it begins to damage the fat cells. Since this acid is natural to our body, it can than safely metabolize and remove the fatty tissues. Most patients will see their results within four to eight weeks as the fat tissues begin to break down and dissolve. Patients should also begin to see a smoother more youthful appearance in the chin and neck area. Because Kybella® is a non-invasive treatment, healing is relatively fast and patients require little downtime with most returning back to work the same day. Activities, including exercise, can be resumed as normal as there are no restrictions following the Kybella® injections. What to Expect During Your Kybella Treatments? Typically, Kybella® sessions will require a series of up to 50 injections into the fatty tissue found underneath the chin. The number of injections will vary based on how much submental fat is being treated. A Kybella® session will take no more than 30 minutes to be administered, and a local or topical anesthetic can be used to for added comfort. Most patients require between two and four sessions which will be spaced out from four to six weeks apart. This will depend largely on the patients’ needs and desired results. The best part about Kybella® are that the results are permanent. During your visit, D. Jacono can also do some complimentary treatments such as dermal fillers and Botox to do a non-surgical facial rejuvenation. Kybella® needs time to work to break down the fatty cells. So, patients who are seeking immediate results should consider other options such as liposuction or other surgical procedures. Most of Dr. Jacono’s patients begin to see the results appear after two sessions of Kybella®. What Side Effects Should I Expect from Kybella? Kybella® unlike liposuction, runs very little risk of scarring or complications. Some common side effects from Kybella® include bruising, temporary numbness, bleeding, and in some cases a mild redness at the treatment area. These side-effects normally go away within 24 to 48 hours following treatments. Rare cases of more serious complications such as nerve damage, difficulty swallowing, and facial asymmetry are very uncommon. More serious complications, such as difficulty swallowing, nerve damage, or facial asymmetry are rare. That is why it is always best to have your Kybella injections administered by trained experts such as Dr. Jacono. Using his training and his own innovative technique, he ensures patients get amazing results without compromising patient safety. If you are over the age of 18 and are looking for significant results in removing stubborn submental fat pockets from your neck and chin area, Kybella® may be right for you. This treatment will provide patients with great results patients for both women and men and regardless of skin types or ethnicity. Kybella® is not suited from anyone with bleeding disorders, infections, or expectant mothers. During your appointment, Dr. Jacono will review your desired goals and your medical history to determine if Kybella® is right for you. To schedule your Kybella® appointment or to learn more about this procedure, please contact our offices today. We have locations in Manhattan and Long Island for your convenience. Call 516-773-2424 today to schedule your consultation. 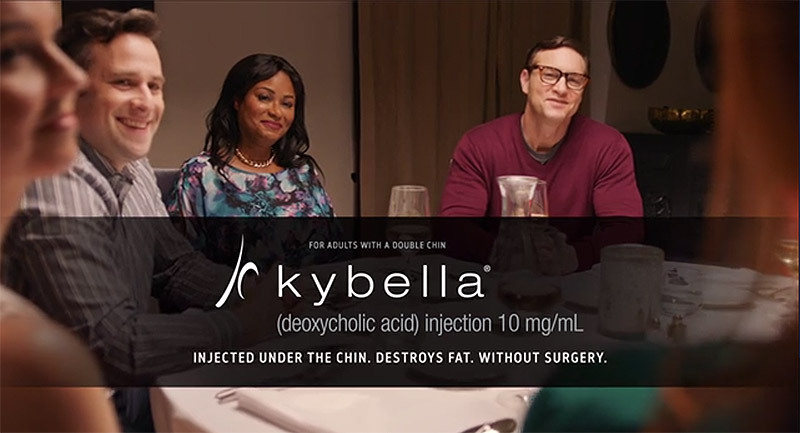 Kybella is the only FDA-approved injectable treatment for adults that destroys fat cells under the chin. The active ingredient in Kybella is synthetic deoxycholic acid, which is a naturally occurring molecule in the body. This aids in the breakdown and absorption of dietary fat. Kybella destroys these fat cells. You will start to see results about 4-6 weeks after the first treatment. There is a burning sensation for about 4-5 minutes during the injection period. That varies by individual but many patients experience visible results in 2-4 treatments. Some patients require as many as 6 treatments, though. Yes. It is FDA approved. There are some possible side effects that you can discuss with Dr. Jacono. The most common side effects are swelling, bruising, numbness, redness, and areas of hardness. What should I expect during a Kybella™ treatment? The treatment area will be cleansed and a template will be applied as an injection guide. Injections follow along with the grid pattern from the template. The treatment takes about 15 minutes or less.